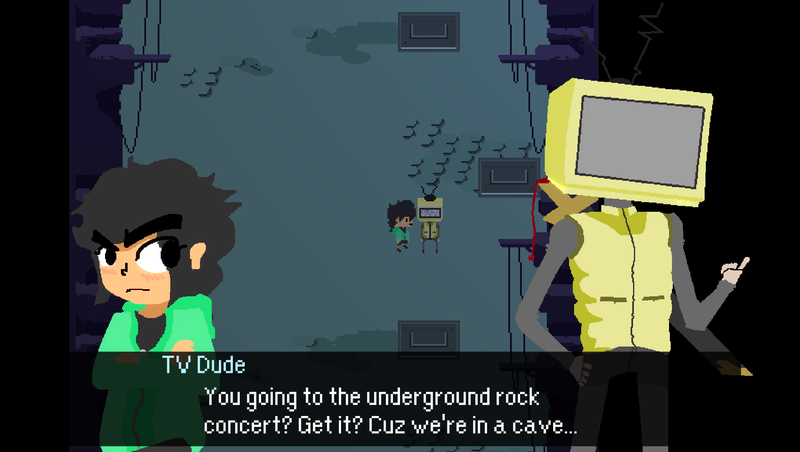 Thomas is creating a retro game about adventure, and a lot of chiptune music. I'm Thomas, and I on and off make music as the chiptune band Melt Channel! I've always thought that games were an amazing medium for communicating ideas and interacting with other people! I want to make something that people can enjoy and I want to make sure that I'm doing it in a way that makes sense. I'm creating a game right now that I've been calling Seven Thousand Summers. My dream is to create an action RPG with a cast of colorful characters, a heavily involved plot and a real sense of presence in the world for the player. A crucial concept for development is I want the game to have appeal for the player who wants to hear the story, and the one who isn't interested at all. For this reason I intend to incorporate some rogue-lite elements that produce randomized dungeons and encounters in areas that the player is free to explore when they're not moving forward in the plot. Players will control a girl called Eli as she explores the remains of an ancient civilization right beneath the rest of the world. Combat will be quick, purposeful, and challenging. But the point of the game isn't just fighting. It will interacting with and understanding the other characters who inhabit the world! And of course finding new clothes and wearing them! I have a serious addiction to making music, and making a story that my music can go along with is a lot of the appeal of this project! I really want to be able to mix my chiptune tracks with more than just guitars and drums. I want to experiment with all kinds of live instrumentation to give it a really depthy feel! Here's a direct link to a track because I can't get the embed code to work right now!!! If you want to contribute to my efforts to make this game it would be incredible!! I'm not a visual artist so at some point I will probably need to hire someone, and if this game gets enough of a blessing to go beyond just something I do in my free time after work, then I'm certain a team will need to be formed. I'm just one guy with an idea, so anything helps! If you don't feel like contributing but are still interested in what I'm doing please follow my personal and band twitters, which is where I'll be posting about this. And if it really looks like something you're interested in please tell people! Word of mouth is the only power I'll have right now as I'm starting to make this game. I'm making a game that I want to play, and I hope you want to play it too!! Thank you so much for believing in me! If you have suggestions I'd be happy to hear them! I'm so glad you want to see this happen! I'll send you a few WIPs of the art that I'm working on!! WOW! Try to stop me from sending you WIPs of art AND music! I would really like to be able to have some money to occasionally commission an artist to help me design background and fill out animations!